This all-new 20-minutes-a-day study of Nehemiah reminds readers that with God’s help, one person who is ready to do the impossible can change the world. Hope is not wishful thinking. It is a confident expectation for the future. Nehemiah knew how to live with true hope. After boldly requesting permission from the king to rebuild the walls of Jerusalem after the Babylonian exile, he restored the city and called his people back to God. Despite opposition on all sides, Nehemiah saw God transform a cup-bearer into a contractor, ruins into a city, and a wayward people into followers of God. 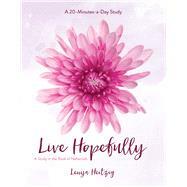 As Bible teacher Lenya Heitzig reminds readers in this new Fresh Life study, God calls them to live boldly with a hope that only He can give. Lenya Heitzig is the executive director of she ministries at Calvary Albuquerque, an award-winning coauthor of numerous Bible studies, and the author of the semiautobiographical book Holy Moments. She is the founder of Mercy B.A.N.D.S. and Reload Love, encouraging and empowering people around the world to stand up to terrorism. Lenya’s husband, Skip, is senior pastor of the 14,000-person congregation at Calvary Albuquerque. Their son and his wife have two children.